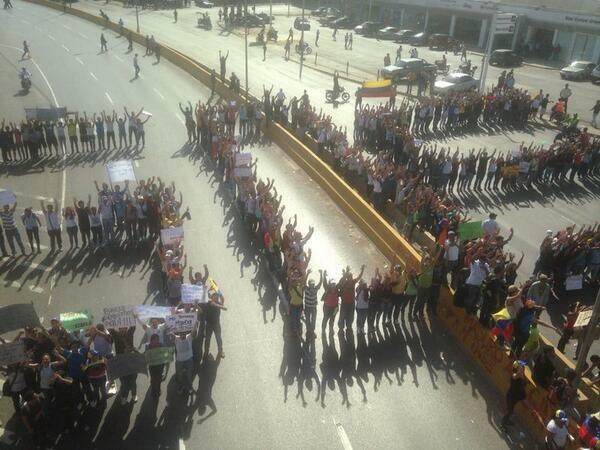 Protest in Venezuela. Photo by Gabriel Bastidas (@Gbastidas) via Twitter. Ellery Roberts Biddle, Marianne Diaz, Weiping Li, Hae-in Lim and Sarah Myers West contributed to this report. In October of 2014, several Twitter users were arrested in Venezuela shortly following the assassination of Robert Serra, a young congressional deputy who was stabbed to death in his home on October 1, 2014. But information about the arrests was scant and the story was scarcely reported by local media until last week, when leaked documents surfaced verifying the identities, locations and other details about the eight Twitter users arrested in connection with Serra’s murder, which shook the country’s increasingly embattled political leadership. Documents confirmed that they were arrested by national intelligence agents and that none of the defendants have stood trial since their arrest. Four have since been released, while four more remain in prison. One leaked report obtained by news site Runrun.es confirmed that Venezuela’s telecommunications agency, CONATEL, provided officials with identifying information, IP addresses and other details to assist in locating and arresting the users. The report is dated June 12, 2014, suggesting that state officials had targeted these users well before Serra’s October 2014 death, and indicating that the assassination merely provided them with an excuse to make the arrests. Among those targeted is Inés González (@inesitaterrible), who holds a PhD in chemistry. González faces charges of “incitement” and insulting a public official. She remains behind bars, despite the fact that authorities have not even attempted to argue that she was involved in any other kind of illegal activities. Victor Ugas (whose account was closed and username then claimed by a different man of the same name) was released just last week after being held for almost nine months for tweeting a photo of Robert Serra’s cadaver that was allegedly taken in a morgue. Ugas is being charged with improper disclosure of data and espionage. Since the adoption of the Law on Social Responsibility in Radio, Television and Electronic Media, CONATEL has had the power to block web content without judicial approval. Though the Venezuelan government has been prone to detaining social media users in the past, it seems that their policies have tightened over the last year, with the wave of blockades in relation to the black market dollar, and filtering measures taken last year at the height of the student protests. Hacking Team sold its software to governments in much of the Middle East and North Africa, including Ethiopia, Saudi Arabia, Bahrain, UAE, Oman, Morocco, and Egypt. Hacking Team appears to have violated UN sanctions preventing the sale of arms to Sudan as well as EU sanctions against Russia. Mexico was Hacking Team’s number one client for spyware. Military agencies, federal police, and a number of state governments purchased the software, some of which do not have the authority to conduct this type of surveillance. Three websites in Ecuador suffered repeated DDoS attacks on their servers after publishing articles about the contracts of Ecuadorian government agencies with Hacking Team. The leaks revealed a vulnerability in Adobe’s Flash Player that allows it to be exploited. Here are two useful guides to disabling Flash for Windows and Mac users. While the Chinese government is notorious in much of the world for its censorship regime, officials have denied on many occasions the government's role in filtering and blocking content from overseas web platforms. A new cyber security draft law may change this. The law would legalize China’s use of the so-called Great Firewall to block access to information that authorities say violates local law, as part of an effort to make cyberspace a more “safe and harmonious” place for Chinese citizens and their government. The law touches many other aspects of digital life too: it would allow Chinese authorities to shut down Internet access to maintain order in the face of “sudden” incidents, as it did in 2009 after deadly ethnic riots in Urumqi, and it would oblige Internet service providers and platforms to monitor user activity and delete content that is forbidden by law. It would also revive and more strongly codify “real name registration” requirements under which network operators would be obligated to deny users access to their services if they were not willing to divulge their real names. The website for Maidan Monitoring Information Center, a Ukrainian organization working to promote civil society development and democratic principles, was recently blocked thanks to a request from Russia’s telecom/censorship agency. The group made repeated inquiries to Wild West Domains, a GoDaddy subsidiary, that yielded no responses – doubly ironic as the NGO had chosen a US-based registrar in an express effort to avoid this type of censorship. As their director put it, “The threat of censorship in Ukraine has dissipated after the political breakthrough of March 2014, but now, ironically, we are being censored by a U.S.-based company.” The website came back online after The Daily Beast sent GoDaddy its own inquiry. The Russian Parliament overwhelmingly passed a “right to be forgotten” bill, which allows people to request that search engines remove links to content that they deem “untrustworthy,” “no longer relevant,” or “distributed in violation of the law.” As we mentioned last week, the bill was scaled back somewhat but was still much broader than that of the European Union and contained provisions anathema to freedom of speech. The law goes into effect in January 2016. Award-winning Thai news site Phuketwan was forced to shut down as two of its journalists face trial in a criminal defamation suit brought by the Royal Thai Navy. Alan Morison and Chutima Sadasathian could face up to seven years in jail for republishing a single paragraph from a Pulitzer prize-winning article by Reuters on the plight of Rohingya refugees. They are unsure whether the site will come back online. Jodi Magi, an Australian woman living in Abu Dhabi, was jailed for “writing bad words on social media” after she posted a photo on Facebook of a car (with its license plate blacked out) parked across two disabled parking spaces. A Belgian court acquitted the so-called “Pirate Bay Four” from criminal copyright infringement and abuse of electronic communications, among others. Co-founders Gottfrid Svartholm and Fredrik Neij, former spokesperson Peter Sunde, and Carl Lundström, an investor, denied having any involvement with the site after it was sold in 2006 to Reservella, a company based in the Seychelles. Telegram, an encrypted messaging app, may have been the victim of a distributed denial of service (DDoS) attack after it experienced a surge of traffic that caused a service failure for 30 percent of its users in Asia. Chinese state newspaper the People’s Daily labeled the app an “anti-government” tool after several human rights lawyers arrested by the government were found using it to communicate. Telegram was founded by Pavel Durov, former CEO of Russian social network VKontakte.